Creative art classes are for kids ages 4 & up. See below for upcoming classes and art camps. Focus is on the process, the creative use of materials (acrylics, watercolors, pastels, pencil, recycled materials, etc.) in producing paintings, drawings, collages, and crafts. Artists and fundamentals are discussed. Projects are modified for age, ability, and interest. $80 a session or $25 a day. Payment is due the first day of session. Summer schedule subject to change. ​Payment is due the first day of session. All sessions are different yet will consist of projects in watercolor, acrylics, drawing, collage, and crafts. Subscribe to AJs mailing list! I get all my work framed at Pollard Studio. 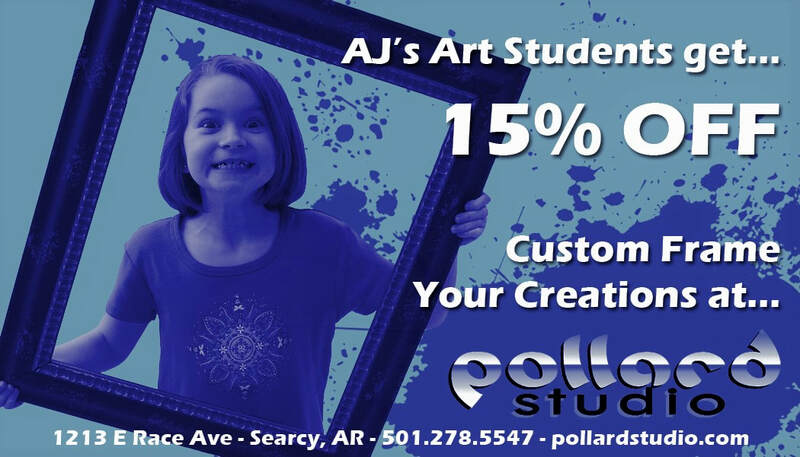 Save this coupon and redeem for 15% off all work done at AJs!